OMG! Jack just asked Rose out on a second date! He asked her out to the movies this time to live out the best high school love story. Rose has to keep the date a secret though, because all of her party friends don't know she is dating again. Jack and Rose share a common love for fashion, and thus they call their relationship, a fashion love story! 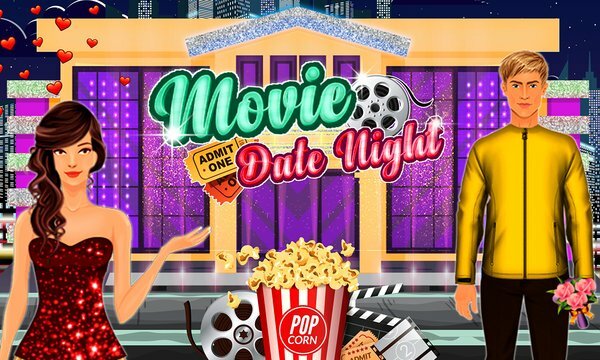 Help dress Jack and Rose in gorgeous clothes for their movie date, but make sure you don't get noticed by Rose's party friends. Follow the high school adventures of Jack and Rose, and watch their summer romance begin to blossom as they try to keep the daring secret of their relationship from all their party friends. The fashion love story between them is true love after all, so you need to help make sure that the lovely couple get to see their love reach a happily ever after. Jack also wants to have an ideal high school love story to remember, so make sure that you give these high school love birds a romantic story to remember! Just as long as the secret of their love doesn't get outed. Keep in mind that Jack has also got his party friends to watch out for, so make sure you don't bump into them too at the movie theatre, as he also has to keep this relationship a secret. Help Jack live out the fashion love story by giving him the best fashion make over for him and Rose too. Rose and Jack first have to meet at the meeting point, make sure that you capture the right backdrop for them. Help them to get a ticket by making sure they are given the right ticket with a good seat too for their date night and also serve the other couples their tickets too. Jack buys his girlfriend a cute souvenir toy from the gift shop. Do an interactive seat cleaning game to help get the movie theatre ready for the show. Lastly, help Rose with her make up and dress up her boyfriend for the occasion.